Popularly known as 'The Land of Tigers', Alwar lies on the fringes of the Aravalli Range in eastern Rajasthan. This city boasts of a glorious past, which is further enriched by the tales of bravery and sacrifice of its people in the days of yore. Formerly known as Mewar, Alwar was a very important Rajput state that came under Mughal control in the 13th century. Maharana Pratap Singh, a Rajput ruler won it back in the 18th century and formed a state of his own. Alwar, which is a bustling industrial town today is supposed to date back to the times of the Mahabharata which is somewhere around 1500 BC. Several palaces, beautiful lakes and colorful markets dot the entire landscape of Alwar, which attracts many tourists all throughout the year. 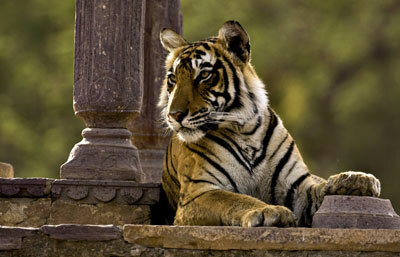 Alwar is also known for the famous Sariska Tiger Reserve, which is a place you must visit if you travel to Alwar. However, the best time to travel to Alwar is from September to March. 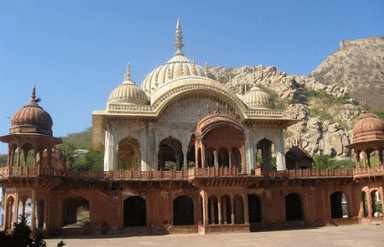 Some of the most famous tourist attractions you can visit if you travel to Alwar are listed below. The Sariska Tiger Reserve, established in 1955 is home to the tiger, nilgai (blue bull), cheetal, sambhar, four horned antelope and the wild boar. Sprawled over a forest area of nearly 800 km, this reserve comes under the Project Tiger. A number of ruined ancient temples can be seen inside the forest reserve. An old palace inside the park has now been converted into a hotel. This is one of the few forest reserves where you can even explore the forest at night. The best time to visit this park is from November to June. This imposing fort that was constructed before the rise of the Mughal Empire, sprawls over an area of 5 km from north to south and 1.6 km from east to west. The Bala Quila further rises 304 meters above the city and also houses a number of temples and palaces. Several huge gates and towers further add to the magnificence of this structure. This is a must visit site if you travel to Alwar. 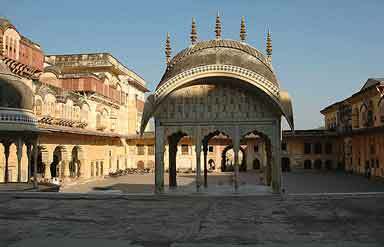 The Vinay Vilas Mahal also known as the City Palace dates back to the 18th century and is a classic blend of Rajput and Mughal styles of architecture. While the ground floors have been converted into government offices, the upper floor houses a museum which has a rich collection ofitems on display. » Road: Buses and taxis connect Alwar to Delhi (164 km) and Jaipur (143). To commute locally cycle-rickshaws and tongas ( horse drawn carriages) are easily available. » Rail: Alwar has a number of regular trains that connect it to Delhi and other parts of Rajasthan. » Air: Jaipur is the nearest airport, which has regular flights to and from Mumbai, Delhi, Calcutta, Jodhpur and Udaipur. 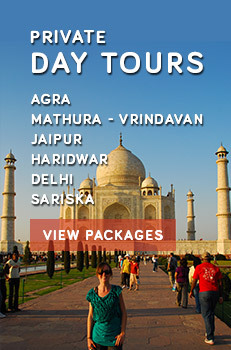 Caper Travel India provides tour packages to Alwar. For more information or to book a tour, please enter your query in the form given.